Did you ever think that a selfie could help the community? It’s a nice thought, right? Toyota recently partnered with Saatchi and Saatchi LA to add a slice of philanthropy to their December Sales Event marketing strategy. They donated money to Boys & Girls Clubs of America for every selfie posted with their campaign hashtag #selflessie. 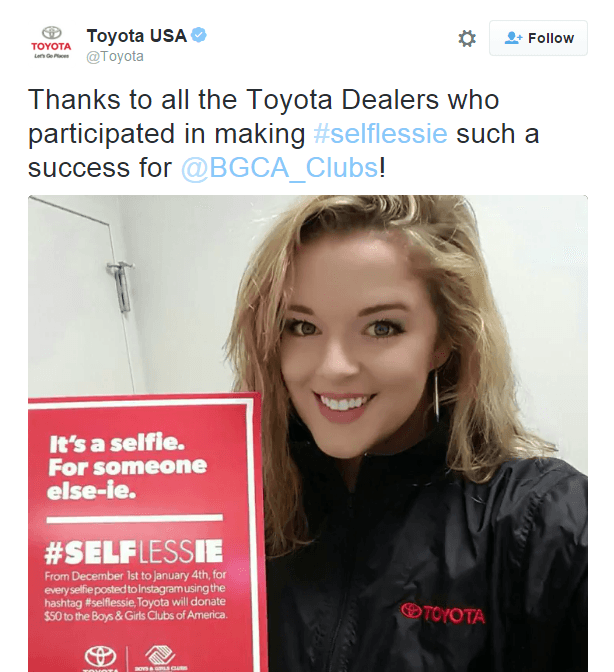 They seamlessly integrated all areas of marketing to promote their #selflessie campaign—an expert move by Toyota all marketers can learn from. One of the most common questions marketers ask me is whether or not they can prove some sort of tangible ROI on their influencer marketing. In the case of Toyota, the answer is clear: yes! 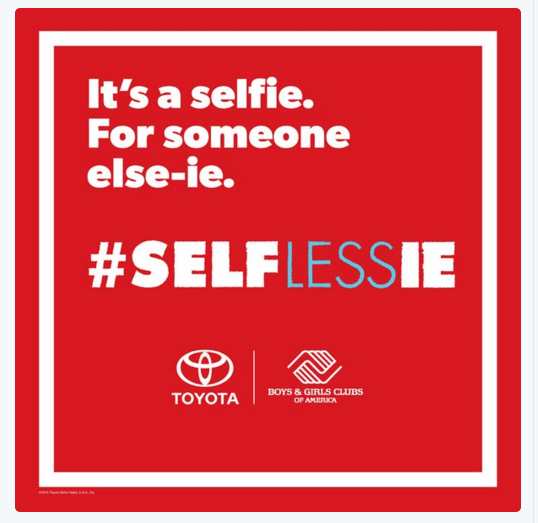 For every picture hashtagged #selflessie on Instagram during the campaign, Toyota donated $50 to Boys & Girls Clubs of America, up to $750,000. The original donation goal of $250,000 was reached so quickly that Toyota Financial Services (an extension of Toyota proper) tripled the donation amount. “We are delighted with the success of the #Selflessie campaign and excited that so many people joined us in supporting such a worthy organization,” said Mike Groff, Toyota Financial Services President and CEO, who also serves as on the Board of Trustees for Boys & Girls Clubs of America. Toyota has a great product already known by everyone and loved by many. This campaign earned them gold stars by adding a human element to their brand. Partnering with Boys & Girls Clubs of America and putting “the average consumer” front and center set the stage for a relatable and shareable campaign. Notice how the conversation never revolved around Toyota—it revolved around the people talking the selfies and the money that Boys & Girls Clubs of America would get. To help spread the word and encourage sharing, Toyota tapped into their social following and employees. Your coworkers are some of the best assets you have to help tell your brand’s story. Not all of us have the luxury of having thousands of enthused employees like Toyota does, but even if we only have three coworkers, it’s important to integrate them. Make sure they are kept up-to-date with the campaigns you are running, and equip them with assets they can easily share on their own social channels. When steering your coworkers or influencers in the right direction for successful posts, it’s good to equip them with basic wording and make sharing as simple as copying and pasting a tweet you provide. I’m not a fan of using paid content as a standalone strategy, but it can be a great way to power earned and owned media. Instead of paying for ads that said, “Toyota is awesome,” or anything blatantly self-promotional, Toyota used their paid ads to promote the #selflessie campaign. If you have the budget, it’s no secret that working with “A-Listers” can be a quick way to spread a message. Toyota enlisted the help of influencers Kelly Rowland, Paul Wesley, and Debby Ryan to get the message out. The hashtag blew up to such an extent that the automaker tripled their original gift of $250k, raising a whopping $750K for the kiddos. Toyota expertly leveraged the voice of a few celebrities to spread the word about #selflessie and to encourage others to participate. The focus remained on the average consumer, so their incorporation of “A-Listers” didn’t feel as alienating as some strategies do. Equip everyone with easy-to-share content and photo assets. Feature real people in your campaign. Make sure your campaign tells a good story. 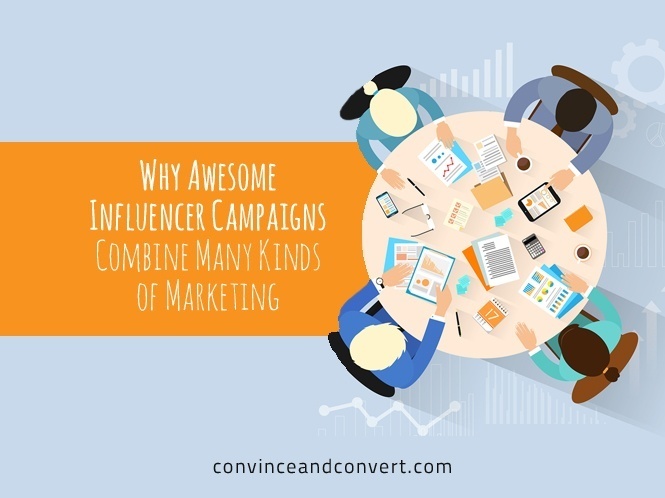 Incorporate influencers, coworkers, consumers, or social influencers. Leverage paid content to power your initiative.